Received September 22nd, 2011; revised October 30th, 2011; accepted November 5th, 2011.
higher education for i n d ividuals who might otherwise not possess the opportunity to participate. shrinking tax bases, and growing demands on federal budgets. different to a graduate tax. for individuals with fewer resources. 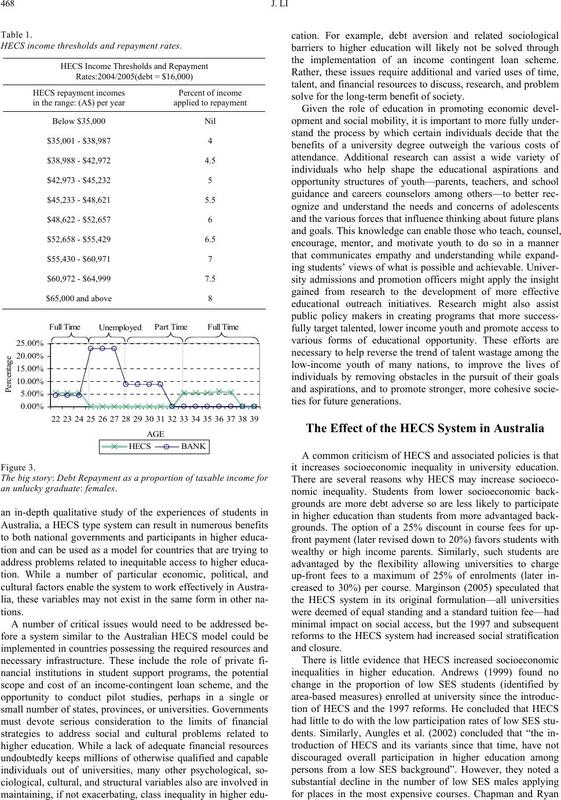 There are several rationales for the Australian HECS system. terms) in Australia is amongst the highest in the OECD. and chose to pay the fee upfront were given a 15% discount. level of earnings above the minimum payment threshold. increased to 25% in 1993. Typical Australian female age-earnings profiles: 2004. Typical Australian male age-earnings profiles: 2004. Bank and HECS repayments can be very different in impact. the income, the higher the repayment percent. sumption smoothing effect compared with bank loan. 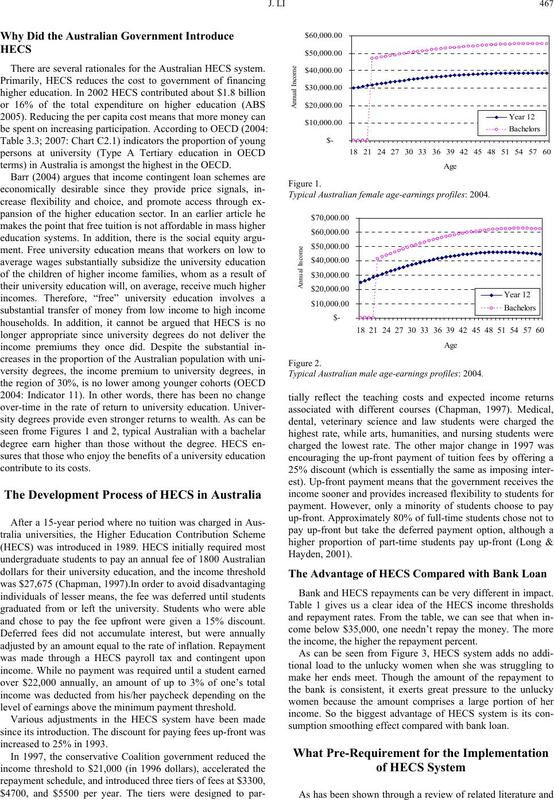 HECS income thresholds and repayment rates. the implementation of an income contingent loan scheme. solve for the long-term benefit of society. it increases socioeconomic inequality in university education. perennial issues related to higher education acce ss and equity. 2005 (Cat No. 1301. 0 ). Canberra: Austral i a n Bu reau of Statistics. sion, Department of Education, Training and Yout h Affairs. Aungles, P., Buchanan, I., Karmel, T., & MacLachlan, M. (2002). 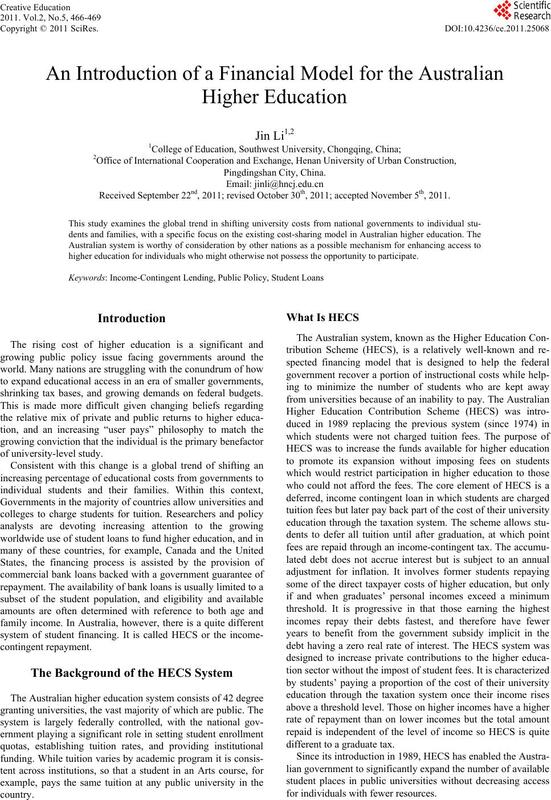 HECS and opportunities in higher education. Draft Working Paper. Chapman, B., & Greenaway, D. (2006). Learning to live with loans? World Economy, 29, 1057- 1075.
contingent charges for higher education: Lessons from Australia. 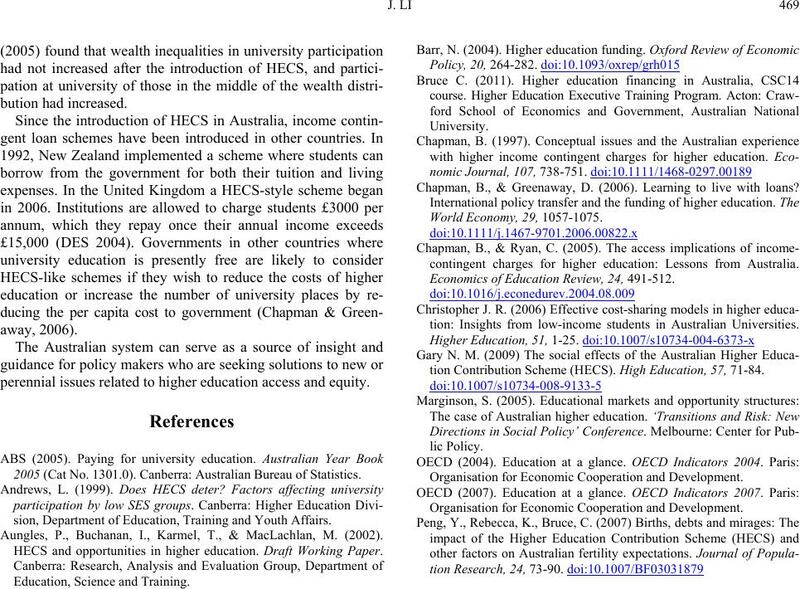 Economics of Education Review, 24, 491-512.
tion: Insights from low-income students in Australian Universities. tion Contribution Scheme (HECS). High Education, 5 7, 71-84. Organisation for Economic Cooperation an d D ev el opment.